Star of many classic television series, veteran actor Kong Ngai yesterday passed away due to lung cancer at the Ruttonjee Hospital at age 81. Actors who were familiar with him all expressed regret. 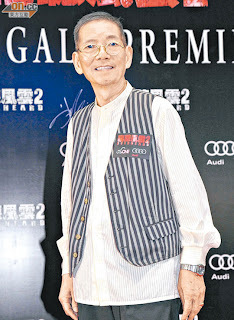 Kong Ngai's final film was OVERHEARD 2 (SIT TING FUNG WON 2). The star of the film Daniel Wu (Ng Yin Cho) through his manager said that working with Uncle Kong Ngai was pleasant, he has learend a lot and wished him a safe journey. Director Alan Mak Siu Fai is planning OVERHEARD 3, in which several characters would have been suitable for Kong Ngai. He expressed regret to learn about his passing and admitted that he would miss his laughter. The last series that TVB producer Lee Tim Sing worked with Kong Ngai on was THE LEGEND OF CONDOR HEROES (SIU DIU YING HUNG JUEN) and praised Kong Ngai for standing firm with his principles. When he saw some training class actors being less than serious he would yell at them on the spot. He was very professional. Currently busy with a play Michelle Yim (Mai Suet) said that during rehearsal someone mentioned Kong Ngai because he used to perform plays as well. Adam Cheng Siu Chau was very upset after learning about Kong Ngai's passing, only saying, "One less friend of many years." Liza Wang Ming Chuen who worked with Kong Ngai on television series YESTERDAY'S GLITTER (GAING WA CHUN MUNG) and HEAVEN SWORD AND DRAGON SABRE (YI TING DOH LUNG GEI) was surprised to learn about Kong Ngai's passing. She asked reporters, "Is it true? I really haven't seen him in awhile because he hasn't returned to TVB. He was a good actor and our elder. I of course regret his passing." Susanna Kwak Kuk Ying worked with Kong Ngai on series THE BROTHERS (CHUN CHING) and THE GIANT (KEUNG YUN). Yesterday she admitted that months ago she visited the hospital and ran into Kong Ngai. Sister Kuk recalled that Kong Ngai was in a wheel chair at the time. She greeted him. At the time Kong Ngai admitted that he was ill but he was still alert. Sister Kuk praised Kong Ngai as a good actor, she admired him very much and regretted his passing. Born in 1932, Kong Ngai Sun was originally named Tang Siu Yi. Born in Zhongshan, Guangzhou, "Kong Ngai" was a name in memory of his most respected percussion master Kong Cham. Before joining show business he specialized in American stocks at an investment company in the 60s. Because he was the youngest, co-workers called him Billy Jai. In 1974 he joined TVB and performed in almost 100 television series, including AH Q JING JUEN, LUNG FU PAU with Shek Sau and Ho Sau Shun, YESTERDAY'S GLITTER with Wang Ming Chuen. His most classic character was LEGEND OF CONDOR HEROES' Or Chun Ngok and THE GREED OF MAN (DAI SI DOI)'s Chan Man Nin. His line in GREED "So many people die, I don't see you die?" became a classic. Rarely had any rumor, Kong Ngai was always single. He said that he grew up in a wealthy family and his family tried to arrange a marriage for him, but unfortunately due to war it was scrapped. Later when he escaped to Hong Kong as a refugee, he ran into someone he liked, but at the time her mother minded that he sold Chinese goods and was poor and the romance went up in smoke. An avid Cantonese Opera fan, he always played the male diva. He once revealed that he was good friends with Leslie Cheung Kwok Wing and Danny Chan Pak Keung.